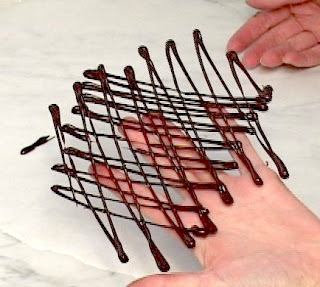 Chocolate Decorating for the Home Chef, Tutorials, Reviews, Chocolate Decorating Supplies for Cake and Cupcake Decorating and Dessert Embellishing. Why is FancyFlours.com my favorite confectionary decorating supply ? Fancy Flours.com is a marvelous top notch bakery supply for cake decorating, cookie, cupcake decorating and all of your confectionery decorating needs .You'll simply go gaga over Fancy's superb offerings, from elegant vintage style wafer paper designs, to snazzy candied flowers, every type of cookie cutter imaginable, chocolate transfer sheets galore, designer cupcake wrappers, baking tools, posh paper products, and loads sugary delights to embellish any edible creation. If you love to decorate sweets, or enjoy creating sugary thingamajigs, Fancyflours.com is the place for you. Cake decorators, candy makers, cupcake enthusiasts, chocolate decorators... a sugar coated nirvana awaits you. I've scoured the Fanciful site, to bring you some of my top picks, just to give you a taste of the offerings. Even if you've shopped at Fancyflours in the past, go back, because I'll tell ya what, new eye candy is being added all the time. Also known as rice paper, is an edible starch based food product used to decorate cakes, cookies and I've also used it for chocolate which yields a similar result to using a transfer sheet ( kind of ). I imagine you can do so many creative things with wafer paper, and I intend to do some serious experimenting in the future, and when I do, you'll be the first to hear about it !. Fancy Flours has a grand selection of wafer paper including some darling vintage designs. Some of my faves are Alice in Wonderland, Birdcages, Chinese New Year , Birthday Cake ( above ), vintage seed packets, and Halloween postcard designs ( see my Halloween Video ). A chocolate transfer sheet is piece of clear acetate paper with a design printed in edible cocoa butter, if you've been hangin' with me for any amount of time, you know how I love to use these, for chocolate dessert cups and making chocolate decorations for dessert garnishes, chocolate transfer sheets can also be used for cake and cupcake decorating and they are so fun and easy to use. I use sugar cake jewels to decorate chocolate dessert cups and for anything I want to add a little sparkle to, which is just about everything. I usually crush them first because I like them jagged. Sweet gift idea... I mean really, how darn cute are these chocolate Kokeshi and Matryoshka Dolls? I just want to bite their little heads off ! 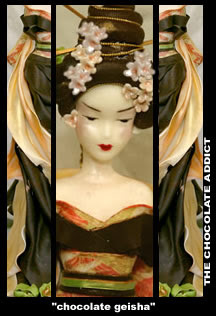 Chocolate Geisha, I made this one ! Love the circus theme on these charming candy boxes, great for cookies and confections. And what about a fussy cupcake house? every cupcake deserves one of these. 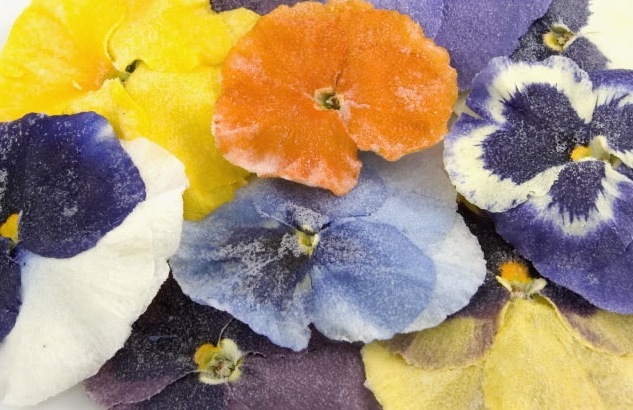 All edible, these flowers would look great on a chocolate bar ( add when the chocolate is melted ), cupcake, or adorned atop a cake. 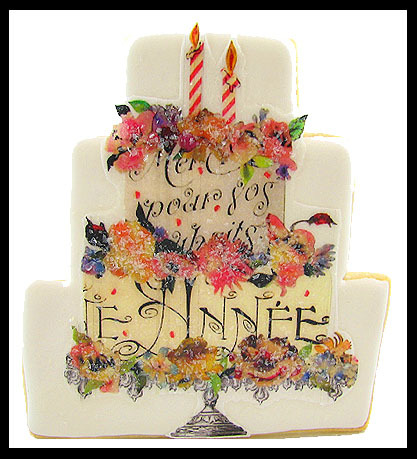 They are SO pretty and look stunning with chocolate decorations such as butterflies and leaves, and really add a colorful touch ( with chocolate ). The Pansies are my favorite, although they also have roses. Are cupcakes taking over the world? well, I know one thing, they have never looked so good. 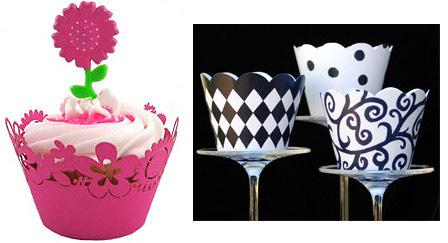 I love these elegant black and white liners and delicate filigree designs for dressing up cupcakes, or flip upside down and wear as a mini hat ! you'll be amazed by the versatility ! Fancy has fun tutorials on the website that will inspire you for days, weeks, even years, and seriously, you will want just about everything you see ( including my chocolate DVD which is also available, so pick up a copy while you're at it ). Fancy must have a team of highly trained, full-time fanciers scouting the planet looking for the best and most unique decorating accoutrements known to man. You'll also want to be sure to get on the mailing list to receive the snail mail order catalog filled with gorgeous photography and terrific ideas. If that's not enough, you'll be amazed by the speedy delivery and just delighted by the arrival of your order when it comes all wrapped up like a little present in black and white paper. These are all of the special touches that make Fancyflours.com my favorite place to purchase all of my confectionary trimmings. Did I miss anything ? I would love to hear about your favorites ! Decorating with Chocolate is So 'a la Mode ! 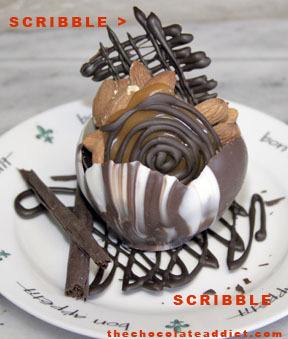 Chocolate decorating is an exciting and fun hobby anyone can enjoy. 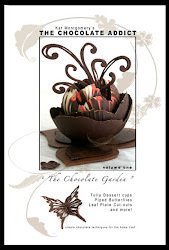 A beautiful chocolate decoration can quickly turn a simple dessert into a spectacular work of art. Techniques can be easily applied to cake and cupcake decorating and are the perfect way to embellish your sweet treats, or created and used for an elegant table centerpiece to accompany a most delicious dessert buffet . When rumor gets around you're decorating with chocolate, you'll get invited to all the hip happenings and will immediately be accepted in all of the highfalutin social circles in hopes that you'll bring a mere morsel of delight upon your arrival. Chocolate decorating is simply marvelous for gift giving, even if your project isn't a huge success, people will still love it and eat it, because, well... it's chocolate, and what's not to love ? I became interested in decorating with chocolate just by trying a few simple techniques I had seen after doing a little research, and also while working on a web design project with a cake decorating friend, who showed me how to make the chocolate roses she uses for decorating cakes. I then decided to decorate a delicious, but very plain store bought chocolate cake ( Trader Joe's chocolate ganache cake, and BTW these are excellent cakes to decorate and are so delicious, if you have a TJ's in your area, you find them in the frozen section ) for a dinner party. For me it's all about presentation, so arriving with a plain chocolate cake was out of the question, I don't care how great it tastes. 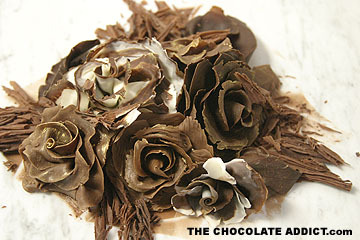 I decorated the cake with a festive bouquet of chocolate roses using modeling chocolate and leaves with tempered chocolate. 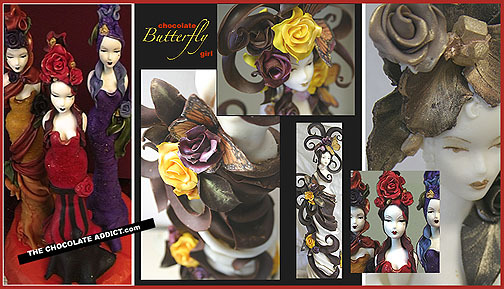 I eventually challenged myself with some chocolate table centerpieces, such as my 14 inch tall art nouveau inspired figures ( using a combination of tempered and modeling chocolate ), whimsical fantasy flowers and giant butterflies and some fancy chocolate dipped dried fruit platters with plenty of added embellishments. Figures in White and Dark Chocolate, edible from head to toe ! I almost always practice an idea out of chocolate coating first ( aka wilton's candy melts or Guittard's A'peels ). Candy coating, what I call "fake chocolate", does not need to be tempered and is a lot less expensive than gourmet chocolate, you can easily pop it in and out of the microwave or just reheat, and you don't have to monitor it as much as tempered chocolate ( see my previous blog for tempering info ). 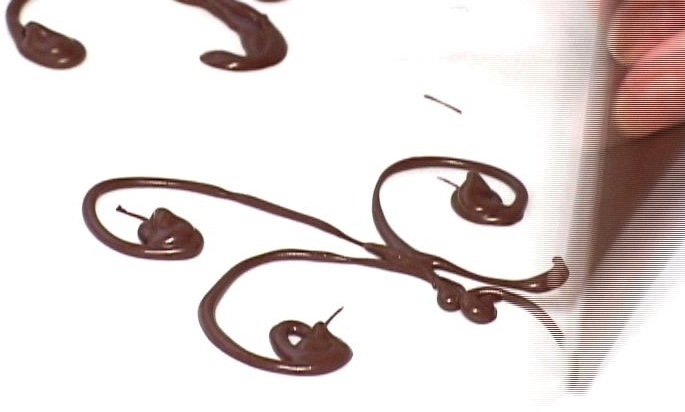 Any chocolate decorating technique can be made using fake chocolate. Once I'm confident with my project, I'll switch to a high quality real chocolate. 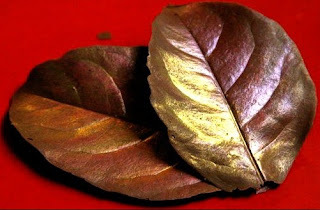 Fake chocolate is great for kids, many people like the taste and don't mind using it all of the time and actually prefer it, because it's so easy to use. You can find Wilton's candy melts at Michael's Crafts, or Guittard's A'peels online, or in some cake decorating and candy supply shops. One easy way to make a chocolate decoration is by piping a scribble with a ( tempered ) chocolate filled pastry bag on a piece of acetate, wax or parchment paper. Make sure your lines are well connected to hold the piece together, and don't pipe your lines super thin or your decoration will break. Refrigerate for 5 minutes and remove from sheet. Decorations can be used as plate embellishments or for the top of a dessert. 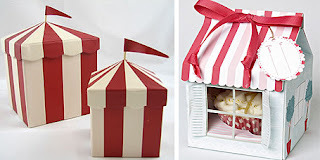 Making large fun squiggles ( not to be confused with scribbles ) with a pastry bag, using a cake decorating tip ( one with is bigger hole ), adding some cut-outs and wrapping in a beautiful box, make wonderful gifts. They look like squiggly chocolate candy bars. I add dried fruit for color accents. I like to make them about 4x7 inches or more, or big and fat.... around 5X5 inches. They also look great in a big candy dish or dessert platter with confections, cookies, fruit etc. as decorative accents. Chocolate adds an element of lip-smacking excitement and sophistication to any event and creating edible art out of chocolate is the epitome of jaw-dropping glamourama. 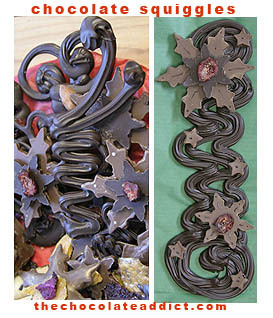 We all know how delicious chocolate tastes, but many people aren't aware of the stunning marvels you can also create. Many common artist techniques can be applied to chocolate decorating, on the flip side, projects are easy enough for anyone to learn, no artistic talent is needed ! 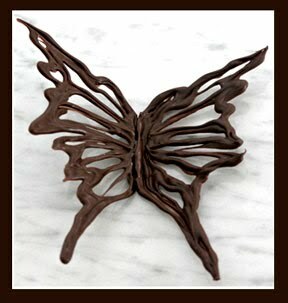 For more fun projects check out my instructional chocolate decorating DVD, The Chocolate Addict Volume One, The Chocolate Garden. And look for my new DVD The Chocolate Addict Volume Two coming in 2011 ! 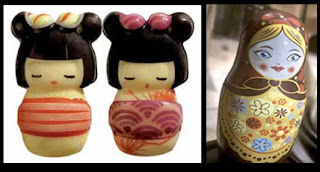 Do you have any favorite chocolate decorating techniques? would love to hear ! Follow my Tweety Twats ! I learn how to make beautiful things out of chocolate, then I show other people how to make beautiful things out of chocolate. I make a lot of silly youtube videos along the way. 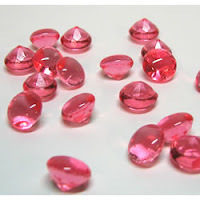 I also like to write about my sugar coated adventures :) Thanks for stopping by ! Like me ? on Facebook ?